While growing up in a rural area of western Illinois outside small-town Geneseo, Blake Burghgrave always had an intense interest in how things worked. It’s safe to say that interest has taken him far. First, to the University of Illinois at Urbana-Champaign, where he earned a degree in engineering physics. Then on to Northern Illinois University, where he expects to earn his Ph.D. next summer. His graduate research in particle physics also has taken him to some of the world’s finest laboratories, including nearby Argonne National Laboratory and then to CERN at Geneva, Switzerland, where he spent the last three years working with a worldwide scientific collaboration. Now Burghgrave’s research—searching for a theorized particle known as a charged Higgs boson—is paying even more dividends. 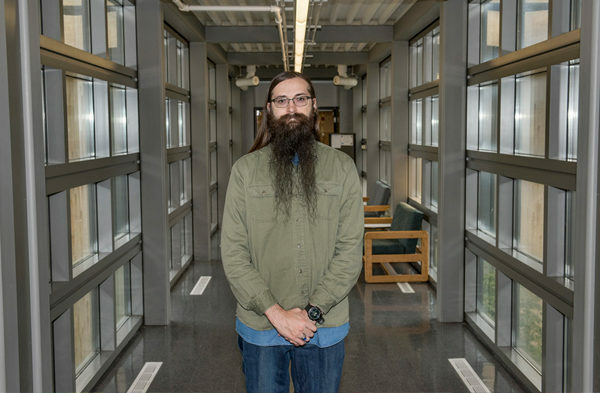 Burghgrave learned recently that he has won the prestigious graduate student research award from the U.S. Department of Energy Office of Science. The highly competitive award is given to students who have the potential to make important contributions to the mission of the DOE Office of Science. From November through August, Burghgrave will receive monthly stipends totaling more than $30,000 to conduct research for his dissertation at Brookhaven National Laboratory on Long Island, N.Y.
“Students such as Blake are our most valuable assets,” said NIU Presidential Research Professor of Physics Dhiman Chakraborty, who is Burghgrave’s adviser. Chakraborty heads an NIU team of faculty and students working on the ATLAS experiment at CERN’s Large Hadron Collider (LHC), the most powerful particle accelerator on the planet. Burghgrave’s research uses data produced by the LHC to probe the atomic world and gain a better understanding of the smallest building blocks of the universe. LHC experiments resulted in the celebrated 2012 discovery of the Higgs boson, the last missing ingredient that had been predicted by the Standard Model of particle physics. The model explains a lot about how the universe works – but it doesn’t explain everything, such as the nature of the mysterious dark matter, which far outweighs the ordinary kind of matter that we are familiar with. To answer unexplained phenomenon, new theories are needed. Finding a “charged Higgs boson” would help scientists determine which theories are most promising. It’s heady stuff, but Burghgrave said it was his long ago interest in how things work that naturally led him down the path of particle physics research.